Turritopsis Nutricula is anything but a quitter. 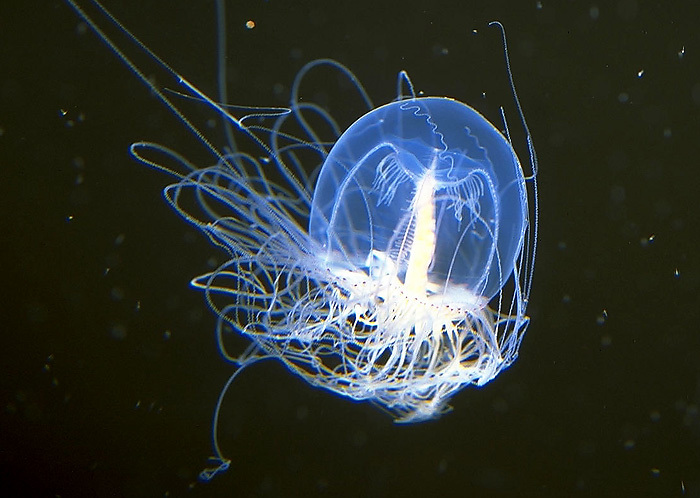 This little jellyfish is the only animal we know to be immortal. It spends its infant stage as a polyp then becomes a sexually mature medusa. But unlike other jellies, after it reproduces it refuses to die and instead returns back to the polyp stage through a process called transdifferentiation. This cycle can continue indefinitely; however, the animal can still succumb to disease or being eaten. I like its scientific name too.. it makes me think of a vampire triceratops (which may be my new favorite hybrid animal). One of my little bunnies, Squirrel, is in the animal hospital tonight and I miss her dearly. If she makes it out I must remember to teach her this transdifferentiation thingamajig. This entry was posted in Nature, Science, Animals, Earth and tagged animal, Immortal, Jelly, Jellyfish, Nature, ocean, Science, Turritopsis Nutricula. Bookmark the permalink. I hope Squirrel is ok.